FIrst, I made a couple of changes to the pattern. First I added a fold in the front - I chose the fold to be 3 cm deep, so I needed to add 2 times 3 cm from the front center line (excuse the poor quality of the pic below - looked good on the camera). I also added 10 in to length (I did not add any length initially, I didn't really need it for the muslin). Second, I added 3 cm to the back yoke for the buttons. Initially I added only 1.5 cm from the center line, but of course, I forgot the part that actually folds below. Oh, and I added 10 in to the bottom back pattern piece - to match the length. And, then, the finished tunic. 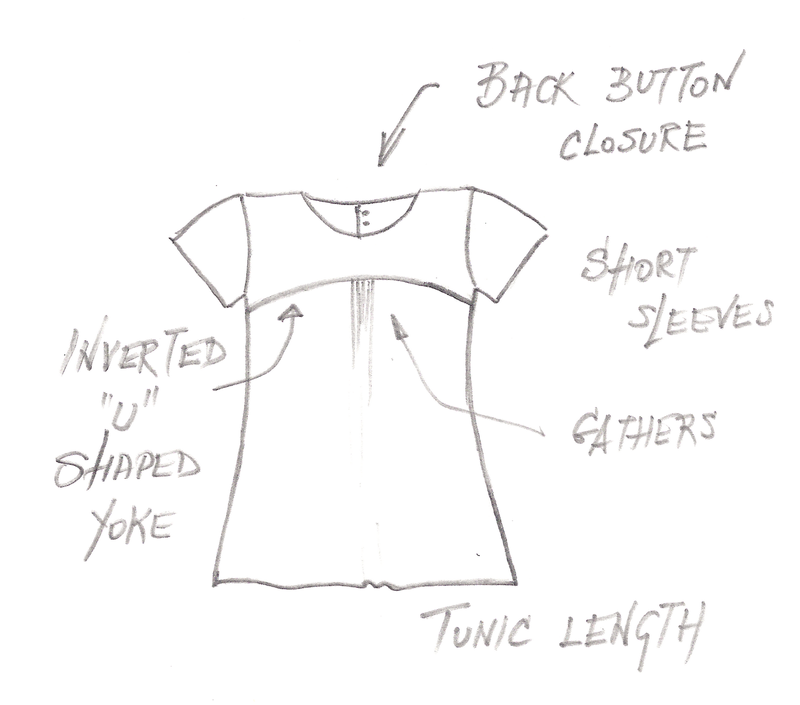 Except for the pleat, the top looks very close to the sketch. Overall, I like it... I like the yoke cut, I thinks it gives a really nice bust shape. I did not find any problems with the pattern and the fit. 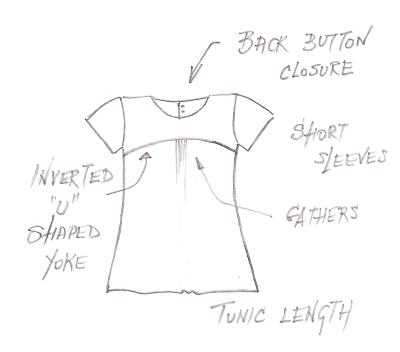 The only thing I might change when I make the final pattern for this tunic is to make the button placket narrower - it does not need to be this wide for small buttons. I don't like the fabric though. It is... blah... Also, it has a terrible drape. It kind of just sits there... I have no idea where I got it, it's been a while. I have no idea of the fiber content, however, it is definitely not cotton. It did not want to be ironed. Also, it stretched like crazy. I did stay-stitch around the neck and arm openings, but for some reason not at the bottom seamline of the yoke. And since the yoke was cut on bias... it stretched even just with ironing. It stretched so much that I did not even have to do any ease at the bust (sheet fabric I used for muslin had almost no stretch and I definitely had to do tiny gathers). Well, because of that, the yoke is wider than it is supposed to be from bust towards underarm. You cannot see it in the pictures, but because of that and the fact that this is very light fabric, the tunic bulges a bit at the yoke line on the side of the bust. Which it did not do on the muslin, so I am blaming it completely on the fabric. Another problem I had I can only blame on me. I wanted to, of course, match the stripes, especially on the front yoke - which is cut on the bias and thus is made of two parts so that the lines are symmetric. I did match the blue lines, but missed the white and orange ones as you can see above. I think the effect would be better if I had matched them properly. I also missed the back yoke. There I did not make the left and right part symmetric at all. Oh well. And, of course I ran out if fabric. I think that it would be worth making another one...this would be a lovely lightweight summer top. The placket sticks out a bit at the back neck...do you think that this is just due to the nasty fabric, or the bias cut or something else? I wonder if the back neck should be cut a tad lower? I like the pleat coming off the front yoke. Katherine, you are right about the placket at back. It is probably both - the flimsy fabric and the bias cut. To be honest, when I figured out that this will not be working out as planned I did not even put in the facing - that would probably prevent the fabric from stretching so much.